Metagaming B.V. does not take responsibility for any consequences caused by your continued use of the Angeldust website, the Angeldust game client and the Angeldust game server. Angeldust account: the combination of a unique player name and an associated password that can be used to sign in to the Angeldust website and Angeldust game client. Angeldust game client: a binary software package created by (and optionally digitally signed by) Metagaming B.V. that allows you to play Angeldust on a device running a supported operating system. Angeldust game server: an online game service offered by Metagaming B.V. accessible via the TCP/IP network protocol. Angeldust website: an online service offered by Metagaming B.V. accessible via the HTTP(S) network protocol. Spam: once or repeatedly posting unsolicited messages and/or promoting non-Angeldust products and services. Supported operating system: any supported operating system as listed on the Angeldust website support page. publish and stream footage, including accompanying audio, of the Angeldust game client under the condition that the Angeldust game client footage (and not its accompanying audio) plays the major role in an original work. You are not allowed to distribute unedited, or the unedited contents of, Angeldust game client files in any original or transcoded form. Metagaming B.V. will never ask you for your Angeldust account password. Never share your Angeldust account password with anyone; only use it to sign in to the Angeldust website or the Angeldust game client. Even though Metagaming B.V. uses advanced encryption algorithms to keep your Angeldust account password secure, you alone are responsible for keeping your Angeldust account password secret. send, receive and accept friend requests and private messages on the Angeldust website. Metagaming B.V. wants to offer all Angeldust account holders a fun and enjoyable experience while playing on the Angeldust game server using the Angeldust game client. not intentionally and/or excessively heal creatures that are engaged in a battle with players. You agree to not intentionally ruin the game experience of other players in any other way not listed above. Don't do to players and buildings what you would not want to be done to you and your own buildings. you grant Metagaming B.V. permission to display, distribute and duplicate your player name and any of your created in-game content in any form. not use the Angeldust game client and the Angeldust website as a communication channel with the intent of keeping your communication covert. 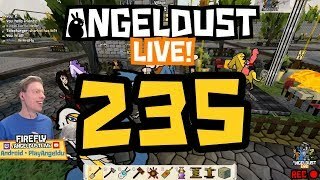 ban or remove any Angeldust account from the Angeldust game server and the Angeldust website. the loss of Angeldust account information and abuse of your Angeldust account by others. the availability and usability of the Angeldust game client, the Angeldust game server and the Angeldust website. Metagaming B.V. falls under jurisdiction of The Netherlands and is governed by Dutch law. register legal cases involving Metagaming B.V. with the Dutch district court 'Rechtbank Zeeland-West-Brabant' or its successor. These terms and conditions (version 2.0) are effective as of April 26th, 2018. Signed by Metagaming B.V. (www.metagaming.nl), registered at the Dutch Chamber of Commerce under #63675897.